Hello everyone! I decided to put a different positive spin on the whole Thoughts.. theme. I've noticed people around me have been down lately. It really seems as if though everyone is just sad. So here are some thoughts that you have on a good day, to inspire you to think these thoughts everyday. "Good job ____, that was a great piece!" Hey, I was just acknowledged for my work, great! "You did so good in English today :)"
People appreciate me huh? That's cool, someone remembered me. "You're right I suppose, that was a good point." My opinion is valid to others. People listen to me! "That jacket looks amazing on you!" People notice me, they noticed a good thing about me today! "I love you, you're hilarious!" People care about me enough to say they "love me". Awesome. I just feel so great today, because so many people care about me. I have this great memory of something good that happened today, and I'll keep that forever! -text message- "You looked gross today.."
This is just a text message, it doesn't bother me because someone else told me I looked good today. This person is obviously too scared to tell me in person, this opinion doesn't matter. I have all these friends who think I'm special, and one little rude opinion doesn't matter. I am a great person, with many qualities. I rule. just remember all these things, and you will have a good day, trust me. But it's also okay to have bad days, just remember these things when you're having a bad day as well. 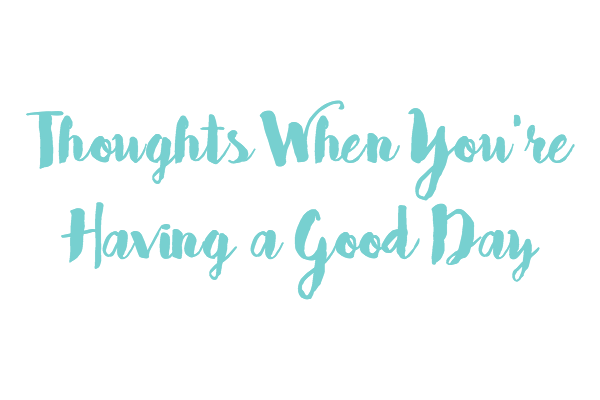 What things do you like about a good day? What do you do on a bad day to feel better? I love these thoughts, Noor! What a great idea this is. I've noticed that a bit too, lately - that a lot of people aren't feeling their best. (I blame the weather lol. At least around here, Mother Nature can't decide if she wants it to be warm, freezing, bright and sunny, or snowing and raining. Changes like that always mess with people's moods.) These are wonderful things to make someone think happier thoughts. 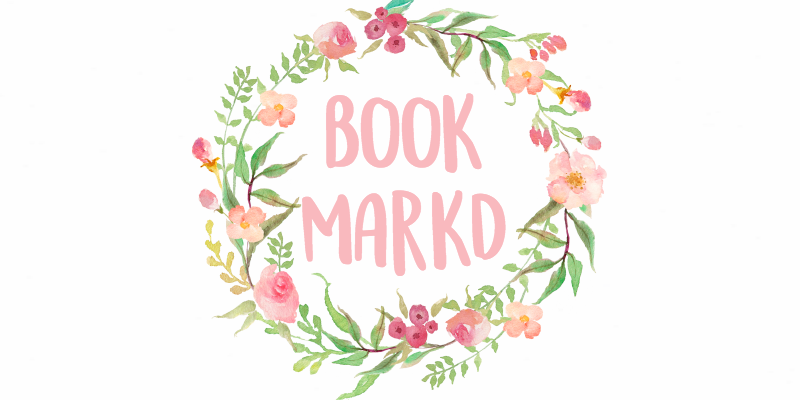 Also, have I said I love your blog design? Because I do. It's simple and just beautiful. It's amazing how just a few words can make you feel amazing, and I'm glad you're not letting a few smaller words make you feel down. For me I remember the bad, but maybe I should start remembering all the good and relish in it. 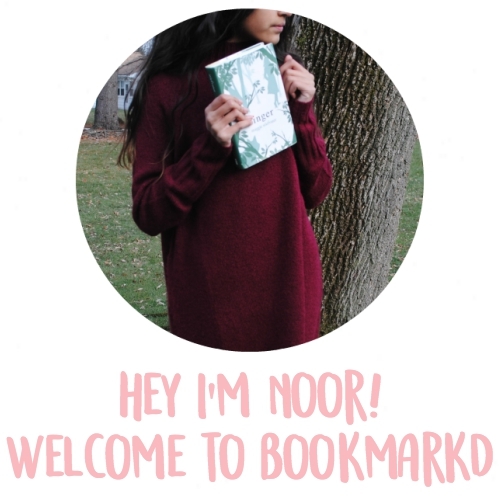 This is an awesome post Noor! i love everything about a good day, andw when I'm having a bad day, i either watch or do anything that has to do with my favorite movie, which ended, or anything to do with selena gomez, or just listen to her songs, you know? Great post, as always, Noor! 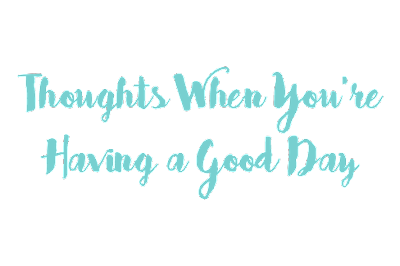 Positive thoughts can defintely lead to a positive day! I enjoyed this post, Noor! A few nice words can make my day too. I wouldn't ever worry about silly texts like that, when you get older you wont have any of it anymore, people can be a lot nicer when they grow up! You already sound like a very sensible mature person. THIS IS SUCH AN ENCOURAGING POST WOW. I feel ten times happier just reading it.